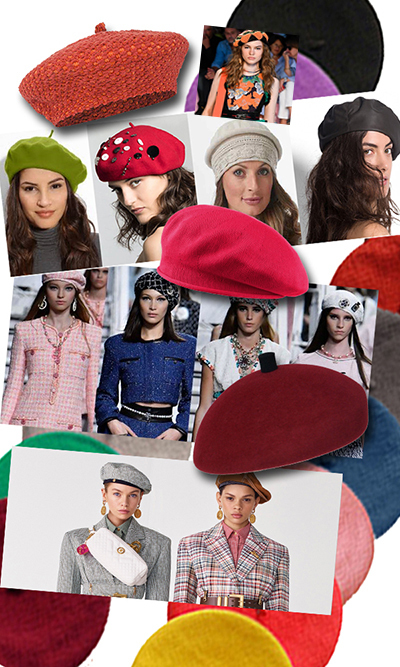 Fashionista’s confirm that the well-loved beret deserves to continue on into spring 2019. The choice of major designers means that this classic hat's popularity goes on and on. Bronté is reintroducing the very popular structured beret (FE47717B) with accentuated stalk that adds a touch of chic to any outfit – we look forward to their arrival. Bronté has also introduced a new woven Parisian beret in wool/Alpaca, which makes an attractive alternative to the classic beret. And not forgetting the ‘Madonna’ an 80’s inspired leather beret, introduced this season by Bronté. The classic French wool beret still remains the favourite and we stock the Parkhurst Basque in a huge array of colours at £25. We also stock the Parkhurst summer ‘Artist’ beret in 100% cotton as well as the smaller Pointelle beret that has a rolled and hand-crocheted band. These cotton styles from Parkhurst serve as light and comfortable head coverage for those who are experiencing hair loss due to cancer, alopecia or other conditions. Founded in 1830 at the foot of the French Pyrenees by Lucien Laulhère, who started to make berets in1840. Being one of the biggest names in beret manufacture continuing their ancestral inheritance and a unique know-how which is held today only by a handful of enthusiasts. Even a company that enjoys its heritage, find themselves extending their profile by looking at the development of their berets in a more fashion-forward way. They are modernizing the classic style into a collection of unique looks for both men and women that will carry the name of Laulhère into a new generation. Look out for the new 'Lara' embroidered beret from Bronté coming this spring. Images from the Chanel Cruise 2019 catwalk, Versace Cruise 2019 lookbook, The Etro spring catwalk. Bronte, Parkhurst and Lauhere. With thanks.